The press release came with a set of instructions about gender pronouns, and I felt the chill wind of political correctness blow across my computer. I wondered: Is Taylor Mac's Hir (pronounced "here"), in production at the Simpatico Theatre Company at the Drake, a protest play against the confines of traditional gender designations or a satire of current gender hyperawareness? Is the press release itself a parody of proscriptive press releases that tell critics what to think and say? Does Mac, recipient of many prestigious honors and awards, all very mainstream (Pulitzer finalist, Guggenheim, Kennedy, etc. ), really prefer judy (lowercase specified) as a pronoun reference to judyself? Well, I girded my cisgender loins and went to Simpatico's production to see what was what. What I found was a sensational comedy, a wild surreal family drama, a passionate indictment of normative masculinity, a blindingly articulate embrace of the possible future, as well as a semi-mocking retelling of "herstory," all delivered by a fearless cast under the direction of Jarrod Markman. Paige (the outstanding Marcia Saunders, who can provide stunning tonal shifts in the blink of an eye) is the wacky mom whose son Isaac (Kevin Meehan, who can really turn on the oorah) has just returned home, having been dishonorably discharged from the Marines. His military task in Afghanistan was to collect body parts. 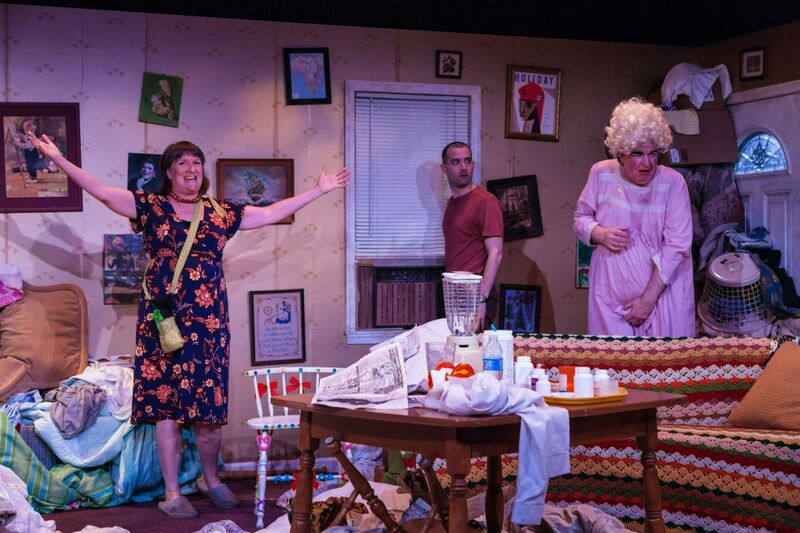 He is astounded to find his father, Arnold (John Morrison), wearing a pink nightgown and full clown makeup, having "lost his privilege" as a straight white male when he had a stroke a year ago after 35 years of crude brutality to wife and children. Paige now controls him with a squirt bottle she wears in a holster. But Isaac has more shocks coming: Sister Maxine (Eppchez!) is in the process of transitioning to male. Max's loneliness in this suburb, where no one within 100 miles feels kindred, is extreme, especially as Paige is homeschooling Max. "Home" is the pivotal and problematic and elusive concept here. Perhaps the oddest – and finest – thing about this play is that all the characters elicit our sympathy. This is comedy at its most human as well as its most bizarre. Act 1 opens with an astonishing mess of a set (designed by Christopher Haig). Laundry – dirty and clean – covers almost every surface; ditto dishes. Many, many pictures cover the walls at odd heights and angles. Act 2 will give us, among much else, "Storytime," a scary/hilarious shadow-puppet show, and will reveal a refrigerator filled with twinkly lights. Although there are obvious debts to Sam Shepard's weird family dramas, Taylor Mac's indictment of the nuclear family goes much further. Hir is a play for this moment, filled with ambiguities and challenges and sympathies. It indicts "rural sprawl," where tacky houses are built on landfill and mortgage debt, demanding we reexamine the American Dream yet again. Hir also requires our reassessment of the conventional binary of gender, providing instead an "alphabet of gender" (LGBTQ doesn't begin to cover it). It's a wickedly entertaining evening in the theater. Hir. Through June 25 at the Simpatico Theatre Company, Louis Bluver Theatre at the Drake, 302 S. Hicks St. Tickets: $10-30. Information: 267-437-7529 or simpaticotheatre.org.